A bonding between a baby Harp seal and its mother is a priceless moment that can not be replaced as it never seems to last any longer than two weeks. A mature female Harp Seal will give birth to one baby every year, usually towards the end of February, and the first thing she does is smell her pup to ensure the family bonding. The mother remembers the scent and will always find her own pup to nurse. This mother has found an ice hole where she comes out of and smells the baby to make sure that it belongs to her. The bonding of a mother and her baby only last about twelve days in which time she nurses. 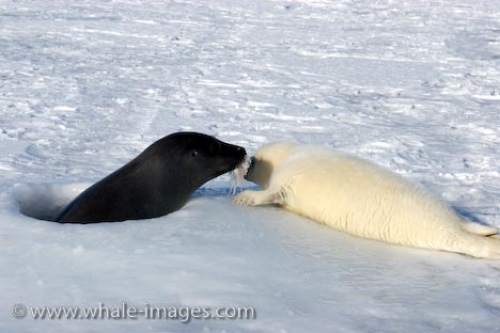 Due to the fact that the milk from a Harp Seal is fifty percent fat, the baby will gain about two kilograms a day. After this time, the baby is weaned and left on the ice to fend for itself, where the pup cries until it calms down and remains inactive in order to conserve its energy. Once the baby Harp Seal reaches about three and a half weeks old, it will then be able to swim and find its own source of food. Before it reaches this point of its life, it remains atop the ice leaving itself very vulnerable to Polar Bears and humans. Once the Harp Seal does learn how to swim, it takes a while for it to perfect its swimming skills which is another reason that many of the pups never seem to bypass their first birthday. Harp Seal pups are still in grave danger as the government still allows the slaughtering of these animals in what they call the "Seal Hunt". The pups get clubbed, shot and skinned alive just for their fur. More people are becoming outraged at these vicious killings and with the help of human involvement like that of Heather and Paul McCartney, hopefully it will come to an end. Each year, more cities and countries are getting involved in protesting the seal hunt by banning seal product imports, walks for seals and giant protest rallies. One would think that all this would finally sink into a government which supposedly cares and the unnecessary brutalization on the Harp Seal will stop. How can any human think that breaking up the bonding that a mother Harp Seal and her baby share is not important and then use the baby for their own selfish reasons.